Petra Kvitova defeated Danielle Collins. Petra Kvitova blazed her way into her first Australian Open final with victory over Danielle Collins under the roof on Rod Laver Arena. With temperatures soaring towards 40 degree Celsius in Melbourne, the tournament’s new extreme heat policy came into play and the roof was closed with the score at 4-4 in the first set. Kvitova, who has struggled in the past in hot conditions, found the cooler temperatures much more to her liking and powered to a 7-6 (2) 6-0 victory in an hour and 34 minutes. This is the Czech’s first grand slam final outside of the two Wimbledon titles she won in 2011 and 2014, and she said: “It means everything. Kvitova had gone from being distinctly under the radar to the title favourite in a couple of days so, as well as being a physical examination, this was a test of how well the Czech could keep her mental cool. Collins’ run has been one of the stories of the tournament and the 25-year-old, who had never previously won a grand slam match, is a confident character who was never likely to be overawed by the occasion. She showed just that early on as she broke the Kvitova serve to lead 3-2, but the eighth seed also brings a fierce intensity to the court and there were several of her famous screams of ‘pojd'(Czech for ‘come on’) as she broke back immediately. Collins looked unhappy about the decision to shut the roof, perhaps knowing that, as a Florida native, the heat could have given her a crucial advantage. 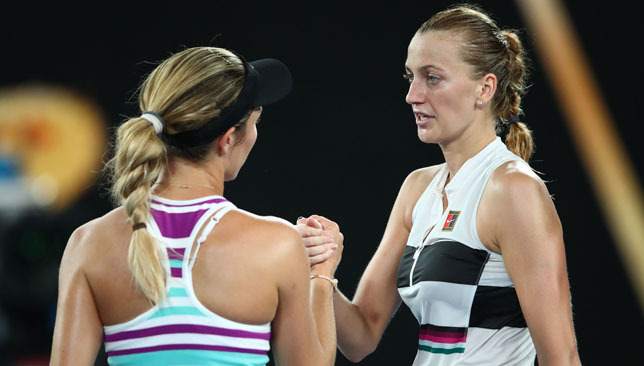 Still there was nothing to choose between them until the tie-break, when Kvitova stepped up to a new level and left a frustrated Collins in her wake. The American had a brief exchange with umpire Carlos Ramos, the central figure in last year’s US Open final drama, over his decision to replay a point after an over-rule but by that point was already 5-1 behind. Kvitova was now well and truly in her groove and Collins found herself helpless in the second set as the eighth seed blasted 13 winners in six games. Roger Federer‘s chances of winning a third consecutive Australian Open title were ended as 20-year-old Stefanos Tsitsipas came of age on Rod Laver Arena. The Greek, who was not born when Federer made his professional debut, has rapidly established himself as one of the most exciting up-and-coming talents in the game and backed it up spectacularly with a 6-7 (11) 7-6 (3) 7-5 7-6 (5) victory to move through to a first grand slam quarter-final. Federer had not lost a match at Melbourne Park since a semi-final defeat to Novak Djokovic in 2016 but his often brilliant forehand was wayward, especially at the big moments, and he failed to take four set points in the second set that might well have changed the outcome. The 37-year-old must have glimpsed something of his younger self in his opponent, from the flowing single-handed backhand, the willingness to charge the net, and the confidence to believe he could beat his childhood idol, just as Federer did to Pete Sampras at Wimbledon in 2001. There was drama from the first game, when Tsitsipas was given two time violations, resulting in the loss of a first serve, and saved two break points. But from there he grew into the match impressively and held his serve more comfortably than Federer, who was struggling to find the timing on his forehand, through to the tie-break. With the tension levels creeping up and up during a dramatic game, Tsitsipas had three set-point opportunities but could not take them and it was Federer who pounced, taking advantage when his opponent appeared to be put off by a shout from the crowd. 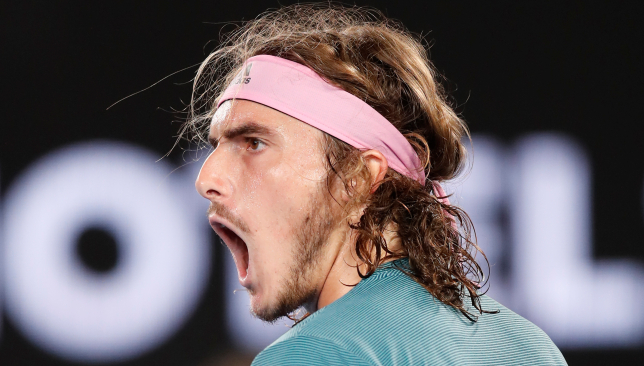 Tsitsipas has received raucous support during the tournament from Melbourne’s large Greek population but, with Rod Laver Arena not open to ground pass holders, most of them had to make do with cheering him on from in front of the big screen. The noise, which could be heard in Laver, gradually reduced as Federer began to pile on the pressure in the second set. Tsitsipas saved four break points across two long service games and then four set points at 4-5. But that galvanised the young Greek, who stands out from the crowd not just with his flamboyant game but his love of photography and philosophy, and he played much the better tie-break to level the match. Federer had tightened back up, with his forehand a liability whenever he had an opportunity to press. Having failed to take any of 10 break points across the first two sets, he missed two more chances in the sixth game of the third set. In the next game, Tsitsipas had his first two openings on Federer’s serve but the Swiss, too, stood firm. However, serving at 5-6, Federer again coughed up two opportunities and this time Tsitsipas took one, inevitably on a forehand error. Rather like when he wilted in the heat against John Millman at the same stage of the US Open, this was a reminder that Federer is trying to achieve unprecedented things, and even the greatest cannot win the ageing game. But, if Federer was feeling the pace, so was Tsitsipas, who called the trainer for a leg massage at 4-3, much to the annoyance of his opponent, who was serving next. The set would be decided by another tie-break, and Federer showed he was not finished quite yet with a brilliant running forehand winner to make it 2-2. However, another missed forehand gave Tsitsipas a first match point, and he did not blink. Serena Williams cruised into the Australian Open fourth round. 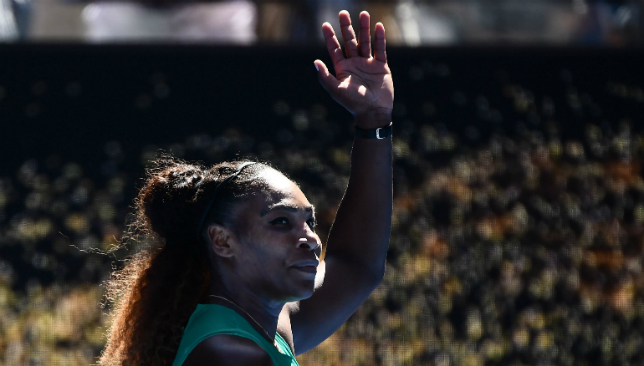 Serena Williams continued to steamroller her way through the Australian Open draw but Naomi Osaka and Elina Svitolina both survived serious scares to reach the fourth round. Williams also talked to Yastremska in the locker room after the match about a time violation the Ukrainian teenager received in the second set that the American felt was unfair.